Builders, architects, and designers seeking options for unique, contemporary handrails may want to consider highly versatile cable railing systems. 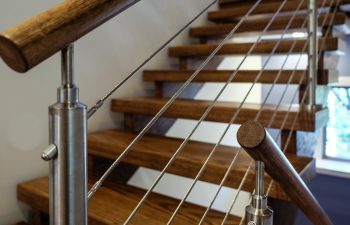 Offering a modern, sleek look to stairs and balconies, cable rail is highly durable and a popular choice for both interior and exterior projects. 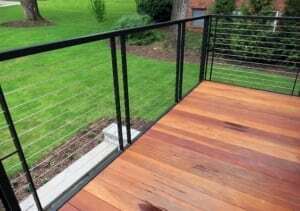 This week, we share some of our past cable railing system project photos for an idea of the versatility and aesthetics associated with the design element. 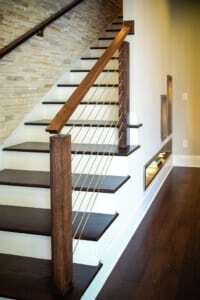 Many customers love systems which pair cable railing with wood handrails and newels. The cable rail combines with the beautifully stained wood to lend a unique feel – rustic warmth balanced by contemporary clean lines. In the first project photo below, dark treads and white paint grade risers create a stunning look. The staircase system is further enhanced by the beautiful stacked stone accent wall. The cable rail system is understated yet attractive, allowing the bold treads and stones to serve as focal points. Next, another wood and cable rail system makes a statement in its residence. The open riser construction showcases the beautiful wood grain from all angles, and the cable rail enhances the stair’s modern structure, offering unobstructed views. Our next cable rail design pairing is stainless steel. Like wood, steel can be combined with a cable rail system to offer aesthetic appeal and high quality. This contemporary combination is an excellent choice for a modern home or commercial space. The project below illustrates the ability of a stainless steel and cable rail system to offer a sleek, minimalist look. 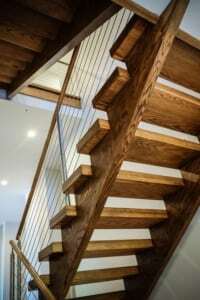 The system fits this residential staircase well, offering a light balance to the hardwood floors and matching treads. As mentioned above, cable rail is an excellent design material for both interior and exterior projects. 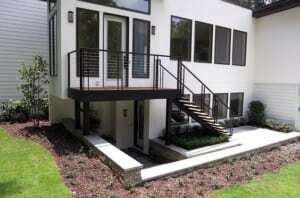 With strength and durability, our cable railing systems are built to withstand the elements. Below, a modern home features a minimalist staircase, complete with a cable railing. The system offers an attractive accent and safety features, while allowing the home’s unique architecture and beautiful landscaping to take center stage. 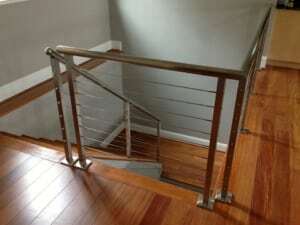 In addition to cable railing, our team crafts handrail systems of wood, stainless steel, wrought iron, and glass. We enjoy the challenge of bringing a unique vision to life and would love to discuss your upcoming project. Contact us today to request a free design consultation or estimate.